Our New Jersey Commercial Pest Management System is a six-step program designed by Cowleys Pest Services from years of experience servicing a diverse commercial customer base. This proven approach maximizes effectiveness and minimizes chemical treatment and exposure. On the initial visit to the account, an audit (thorough inspection) is performed and documented in our Pest Control Audit inspection forms. This allows us to determine what pest problems are present, likely harborage areas, resource sites, sanitation problems, and possible re-infestation sources. 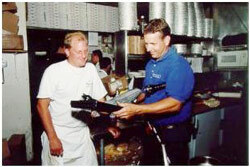 Based on the findings of the audit (inspection) a thorough pest management plan is customized for each establishment. The treatment plan is designed using EPA registered pest control products. These applications may include residual treatments, insect growth regulators, crack and crevice treatment, flushing agents, baits, and traps. An appropriate number and location of monitoring stations are determined as well as the frequency for checking the stations for pest activity. A follow up meeting at the site, with management and staff, may be necessary to educate personnel about conditions that promote pest problems and how these conditions can be corrected. We'll readily conduct training presentations for your staff if desired. Initial treatments vary in scope and intensity depending on the findings of the pest control audit (inspection), and the pest management strategy being implemented. Severe initial infestations may require one or more follow up treatments that are specified in the original treatment plan. Part of our Quality Assurance program is having senior management periodically inspect our client's facilities. At this time, all of our services are evaluated to ensure our clients are receiving the highest level of service-excellence and our standard operating procedures are followed. Additionally, during each technician visit, all monitoring stations are inspected for the presence of pests. Our pest control technicians are continuously trained to look for signs of any pest activity such as damage, deposits, trails, active harborage sites, and conditions that could lead to re-infestation. Pest removal action taken by our service technicians are documented in a site service log.